As regular readers know, it’s time for me to begin posting my mid-year “The Best….” lists. There are over 1,900 regularly updated lists now. You can see them all here. It’s possible that a few of these sites began earlier than this year, but, if so, I’m including them in this list because they were “new to me” in 2018. 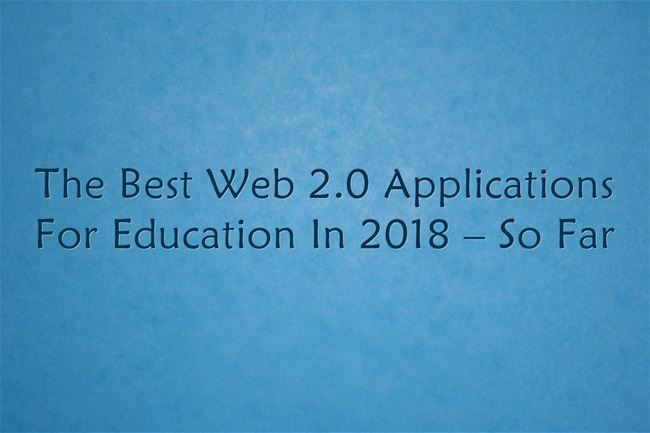 You might want to visit previous editions, as well as The “All-Time” Best Web 2.0 Applications For Education; The “All-Time” Best Ways To Create Online Content Easily & Quickly and The “All-Time” Best 2.0 Tools For Beginning English Language Learners. I don’t rank my mid-year lists, but do place them in order of preference in my end-of-year lists. Just because a tool is on this mid-year list does not mean it will make the cut for the year-end version. Feel free to let me know if you think I’m leaving any tools out. Apagraph lets you create visually appealing online quotations. I’m adding it to The Best Tools For Creating Visually Attractive Quotations For Online Sharing. Animaker Edify is a new educational feature of the popular tool for creating animations. Teachers can create virtual classrooms. I’m adding it to The Best Ways For Students To Create Online Animations and to The Best Sites Where Students Can Work Independently & Let Teachers Check On Progress. Edji looks like a very cool tool for annotating online text. Students can use various tools, including leaving audio comments. I’m adding it to The Best Applications For Annotating Websites. Digimix lets you create personalized music playlists, along with writing individual comments about each song. Russel Tarr’s ClassTools site is on a zillion of my “Best” lists, and he keeps on making it better and better! His newest addition is a super-easy tool for creating sequencing activities, “Drag and Drop.” It can be used in lots of lessons, and I’m adding it to The Best Sites For Creating Sentence Scrambles. Google unveiled a neat new feature – teachers and students can now create their own virtual reality tours! It’s call Tour Creator, and looks very cool. I’ve compiled lots of resources about it here. Wrish lets you create a webpage (that can remain editable or not) with text and images easily and without required registration. I’m adding it to A Few Simple Ways To Introduce Reluctant Colleagues To Technology. That’s part of a larger My Best Posts For Tech Novices (Plus A Few From Other People) list, which needs to be updated. Branch is a new smartphone app that lets users create collaborative stories. Motion Comics lets you create a comic that can function like a slideshow with music, like this one. Unfortunately, you have to upload any of the images or sound you want to use – they don’t have a “bank” you can draw from. I’m still adding it to The Best Ways To Make Comic Strips Online. Vinstant looks pretty interesting. Basically, you mix and match different video clips in order to tell a story. The app isn’t public yet, and, though they say they’ll have a web-based version, that’s not available, either. But I think this could be very useful for English Language Learners. National Geographic has just unveiled Open Explorer. They call it a “digital field journal” where anyone can document their exploration of anything (they use “your backyard” as one simple example), as well as follow the explorations of others (many are much more involved than a backyard). You need to register for the site, which takes a few seconds. The buttons to “start your own expedition” don’t seem to work right now, but you can easily get to it by clicking on the “Dashboard” button at the top right of the screen after you register. I’m sure they’ll fix that glitch soon. You can read more about it at Why We Created This First-of-Its-Kind Digital Field Journal. Toonator lets you easily create simple animations. I’m adding it to The Best Ways For Students To Create Online Animations. The American Chopper Meme has been all around the Internet (see ‘American Chopper’ Angry Meme Resurfaces and Takes Internet by Storm). You can easily make your own at American Chopper Argument Meme Generator. Read Ahead looks intriguing. It lets you paste text, or import text from a url address. Then you can divided up the text into “chunks” that appear on slides, along with identifying key words. The text then appears as a slidedeck. Here’s one I quickly did. It’s also free. The site suggests that it assists comprehension, which makes sense to me. Practically speaking – for me, at least – I could see using it as an easy way to create a slidedeck for a text I want to display to a class on a computer projector. Also, I think it could also be a useful tool for students to either display their own work for classmates to read, or to choose online text and demonstrate strategic thinking by how they would display it for easier comprehension (they’d also show further critical thinking by the key words they chose to highlight). Scratchwork is an online collaborative whiteboard that seems to be designed with using it for math in mind. I’m adding it to The Best Online Tools For Real-Time Collaboration. Diveo is an app designed to have multiple people upload video from the same event to one place, where it can all be edited. It’s obviously ideal for field trips. I’m adding it to The Best Web Applications That Lets Multiple People Upload Their Photos To One Place, which I just revised and updated. Zanifesto is a new tool for creating infographics. I learned about it from Richard Byrne. I’m adding it to The Best Resources For Creating Infographics. Anchor is an extremely easy and free way to create podcasts. Even though it’s super-easy, it can never hurt to get instructions, and Richard Byrne has created a step-by-step video explaining how to use it. They also announced a super-neat new feature: the ability to automatically take snippets of your podcast and turn them into videos highlighting text. Timelinely is a new free tool that easily lets you create an interactive experience for any YouTube video. You just copy-and-paste the url of the video and then can easily pick moments in the video where you want to write added comments, annotated with an image, or add a link for more information. You can also interact with views through a comments section (you have to be registered with the site to leave comments). They don’t yet have an embed feature yet, though say it’s coming soon. You can see some things I did with a video of me talking about student motivation here. I’m adding this info to A Potpourri Of The Best & Most Useful Video Sites. I blogged about PairPrep a couple of years ago, and it was then sort of a learning game site. They seem to have “pivoted” to become an easy tool for teachers to digitize their student hand-outs and worksheets to make them interactive (maybe similar to Wizer). No, I’m not a big fan or regular user of “worksheets” but, like many things, I think they can have a useful place in the classroom, but also have to be “kept in their place.” It seems to me that PairPrep could come in handy. I’m adding it to The Best Sites That Students Can Use Independently And Let Teachers Check On Progress. Google unveiled a new and cool Songmaker tool (you need to use Chrome to access it). Just click on a few boxes and your song is born! I use tools like this one (see The Best Online Sites For Creating Music) for English-language development activities (see The Best Music Websites For Learning English). For example, students will create music and have their classmates describe what it makes them see when they close their eyes. StoryWeaver looks like an amazing site that is designed to create and translate children’s books into a ton of different languages and make them accessible online for free. Users can translate books that are already there into different languages or easily create there own books. It’s a great site for students to write for an authentic audience. ELL teachers and their students could get a lot out of the site, and it seems to me that other language teachers could have their students use it, too. Pixorize lets you annotate online images. You can read more about it at Richard Byrne’s blog and watch the video below. I’m adding it to The Best Online Tools For Using Photos In Lessons. Rocketium lets you create those types of videos you see everywhere with images that have text laid on top of them. Rocketium refers to them as “Buzzfeed-style” videos. I’m adding it to The Best Tools That “Automatically” Create Presentations, even though I wouldn’t call it “automatic.” It sure is easy, though. I am just not sure where else to put it right now. One Met. Many Worlds is a cool online interactive gallery from The Metropolitan Museum Of Art. You can explore how certain words/themes have been illustrated in different works of arts across many cultures, and also “pair-up” your own preferred images to share online. I’m adding it to The Best Ways For Students To Create Their Own Online Art Collections. Webjets is new free online tool that’s similar to others on The Best Online Virtual “Corkboards” (or “Bulletin Boards”) list. Though it doesn’t have as many bells-and-whistles as Padlet does (see Padlet Now Lets You Record Audio – Zooms To The Top Of Most Useful Web 2.0 Tools For ELLs), in some ways it seems a little easier to copy-and-paste images and organize them. Short videos from journalistic sites (including Ed Week and Edutopia) have included images overlaid with text, accompanied by music. They’re very engaging, and I’ve wondered how they create them. Now, I don’t have to wonder any longer, because there’s a free web tool called Lumen5.With the assistance of Artificial Intelligence, you just paste in the url address of a blog post or article, highlight the text you want to see in the video, identify the images you want to go along with the text, along with choosing music, and your video is done! If any blogger wants to expand his/her audience with video, I can’t imagine a better tool available to help make it happen. Kapwing is a video editor. I’m adding it to Not The “Best,” But A List… Of Online Video Editors. Snappa and BeFunky offer infographic-creating templates. I’m adding them to The Best Resources For Creating Infographics. Jot Form lets you easily create online…forms. Beautiful [AI] uses artificial intelligence to automatically create presentations. Apester is a free tool that lets you create pretty dynamic looking interactive presentations. Data Wrapper is a new site that lets you create interactive charts and graphs. I’m adding it to The Best Resources For Creating Infographics. Loom lets you easily make screencasts, though it can only be used in Chrome. Flourish looks like a good new site for creating infographics.. I’m adding it to The Best Resources For Creating Infographics. Kapwing lets you very easily create memes. I’m adding it to The Best Tools For Making Internet ” Memes.” I’m also adding it to The Best Sites For Online Photo-Editing & Photo Effects because it lets you create photo speech-bubbles. This looks interesting: InsertLearning is a Chrome extension that lets you turn websites into interactive lessons. I Fake Text Message is a simple tool to create…fake text messages. I’m adding it to The Best Tools For Creating Fake “Stuff” For Learning. eStory is a new free online timeline-making tool. It’s a quick-and-easy registration process, has a very intuitive interface, and the timelines themselves are attractive. And, it’s free. What’s not to like? I’m adding it to The Best Tools For Making Online Timelines. Quick, Draw! is a tool from Google that tells you an object and then gives you twenty seconds to draw it. People have drawn one billion images using it, and Google uses them to make its “machine learning” better. You are given six items to draw and then it shows them all, along with providing you the ability to compare your creations with others. Pantrom seems like a very easy new tool for creating simple collaborative webpages. You can create up to ten for free. I’m adding it to The Best Ways For Students Or Teachers To Create A Website and to The Best Online Tools For Collaboration — NOT In Real Time. ReClipped seems like a neat new tool. You can read more about it at Richard Byrne’s post, ReClipped – Take Notes and Share Notes on Educational Videos. I’m adding it to A Potpourri Of The Best & Most Useful Video Sites. GameBuilder lets you create lots of different types of learning games – see the screenshot above to see the options. Once you create it, anyone with its url address can play. The site also has a large collection of games created by its users. The site is sponsored by Wisc-Online, which “is a creation of Wisconsin’s Technical Colleges and maintained by Fox Valley Technical College.” And it’s free! I’m adding this site to The Best Websites For Creating Online Learning Games. LiveWorksheets lets teachers either create, convert, or borrow existing worksheets and make them “fillable” online. You can create virtual classrooms (called “interactive workbooks”) of assigned activities where teachers can monitor student progress. I’m adding it to the same list. Thanks to Nik Peachey for the tip. Joomag lets you create interactive content, but you really want to go to Richard Byrne’s blog post to get a better understanding of what it is. It does offer a free education feature. Stelum is a site that lets users write and read simple explanations of complex topics. I’m adding it to The Best Places Where Students Can Write For An “Authentic Audience”. Thanks to Richard Byrne for the tip.